Welcome back to the Wellness Basics blogging series where we chat about the basics of wellness, well-being, and learning how to thrive. Today’s topic is Emotional and Mental Health. What is Emotional & Mental Health? Emotional and Mental Health is all about your feelings and emotions and your ability to deal with the demands of life. The emotional aspect refers to your ability to identify, process, and express emotions in a healthy manner. The mental aspect refers to your ability to cope with life events and handle personal responsibilities. As well as connecting to a person’s self-confidence and their overall life satisfaction. A quick note: This post offers a general guide to emotional and mental health. While incredibly important, this post is not a look into the vast and complex topic of mental illness. As I am not a mental health professional, I am not qualified to speak on the topic of mental illness and feel it is would irresponsible if I attempted to do so. For more information about mental illness, please refer to the CDC. >>> Teach emotional literacy with this Inside & Out of Emotions bundle. As the status of one dimension of our life shifts, it creates a tangible reaction in the other dimensions. For this reason, the state of a person’s emotional & mental health greatly influences the overall status of their well-being. Allow yourself to feel all the feelings. We feel a vast array of emotions for a reason. Each one plays a significant role in our lives and should be experienced. Don’t overcommit. It’s super easy to take on more than we can handle. Then feel like a failure when we can’t manage the unrealistic workload. Protect your time, don’t overbook yourself. Take a break. Take a break from work. Take a break from technology. Take a break from the busyness. Every day find time to rest, relax, and recharge. Get out and move. Fresh air and activity works wonders. A walk or a jog a day helps to clear the mind and refresh the soul. Mental Health needs to be an active element of your classroom experience! If we want to empower students to thrive, we must promote each of the dimensions of health and teach them how to strengthen each component. Which means Emotional & Mental Health needs to be an active element of your classroom experience! Here are a few things you can do to enhance your students’ emotional and mental well-being. Creating a manageable school workload and be understanding and flexible when kids just have too much on their plate. To help you promote mental health, I have a little gift for you. Today, I’m sharing a mental health activity all about building coping skills. 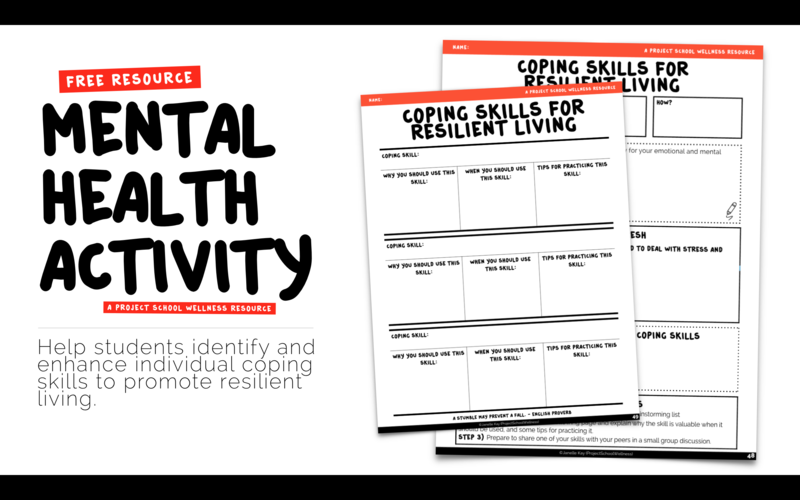 With this free resource, students learn what coping skills are, identify personal coping skills, and explore ways to use them in their own life. To continue our conversation about Mental Health, next post I’m gonna be talking about how this book completely changed how I see my students with anxiety!